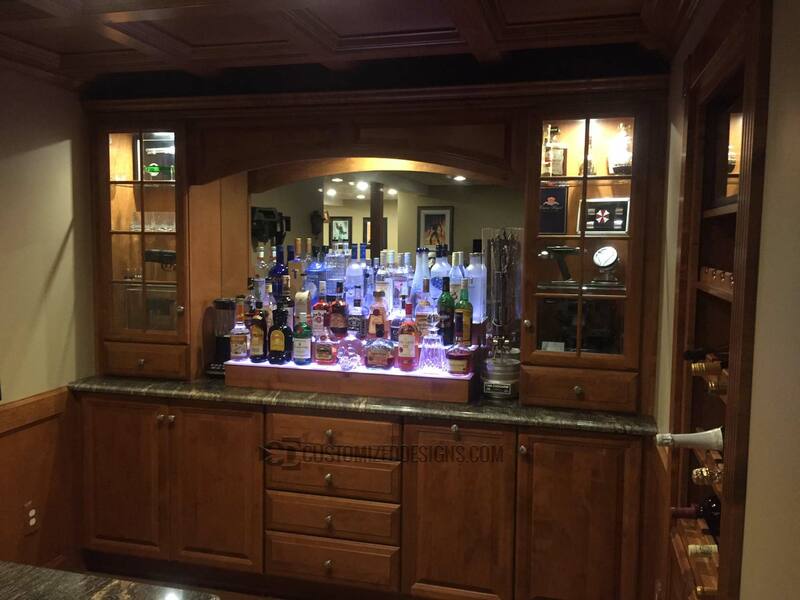 These are a few super cool pictures one of our customers sent us showing off their sci-fi themed home bar. If you’re a true nerd you’ll be able to point out what all the cool movie props are on the shelf. Some of the props they have include: A Terminator hand from Terminator 2, a case with the T-Virus canisters from Resident Evil, Star Wars Blaster, Star Trek Phaser and a few other cool things. As for the display, it’s a 42″ 3 tier liquor shelf with unfinished cherry veneer. They opted for the unfinished cherry in order to stain it themselves and make sure it matched their bar cabinets perfectly. It turned out great!